Last night Pedestrian Safety improvements along Croydon Road took a step further. The Crossing on Frederick Street including relocation of a bus stop were implemented in June 2018. Last night, the Council adopted the recommendation and minutes of the 4 December Traffic Committee meeting with an amendment in response to a resident's concerns about the urgent need for a pedestrian crossing at Church Street [Item 8.2 below] and correction of a typo at Queen Street [item 7-1(f) below]. Last night Dulce Munoz Garcia, the National Convenor of Mums4Refugees came and spoke in support of in support of the Inner West Council joining THE LOCAL GOVERNMENT MAYORAL TASKFORCE FOR PEOPLE SEEKING ASYLUM TO ADVOCATE AGAINST THE SRSS CUTS. other pockets along White's Creek. Of the 1675, 107 were identified as high value. Petrol Station The Annandale Theatre, was demolished in 1961 and replaced with the Petrol Station. Verandahs and Awnings Parramatta Road was widened and verandah posts were removed and replaced with awnings. Goodman Buildings verandahs were removed at some point. 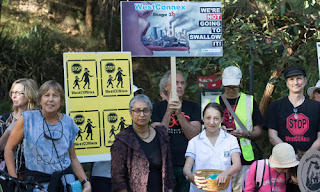 Buruwan Park Annandale is a rare green space threatened by Westconnex. The park was created around 1995 by converting Gordon Road Annandale to park and connecting pockets of land owned by Sydney Water and Sydney Trains. The park is adjacent to White's Creek and has many mature trees including an outstanding Fig Trees. Volunteers and Council contractors have introduced and cared for local provenance plants in the park since its creation. Buruwan Park provides a pedestrian cycle link between the Rozelle Bay Light Rail Stop and the 433 Bus Stop on the Crescent Annandale. It is also provides a pedestrian and cycle link from Railway Parade Annandale to the Crescent, the ANZAC Bridge and the Annandale Foreshore. Transport NSW wants to destroy the park to widen the Crescent. The widening of the Crescent was part of the EIS for Stage 3 of Westconnex in 2017. However, new plans for the roads were included in the Western Harbour Tunnel Plans for the Rozelle Interchange. Yesterday, I popped in to check out the Annandale Sewing Bee run by Boomerang Bags Inner West at the Annandale Community Centre, 79 Johnston Street Annandale. When I arrived, there were lots of people already busy pinning, at sewing machines and overlockers, with a stream of new arrivals armed with machines. Future Sewing Bees at Annandale SUN 17 March 2019 1-5pmSUN19 May 2019 1-5pmSUN 16 June 2019 1-5pmSUN 21 July 2019 1-5pm Boomerang Bags Inner West also has sewing bees at Marrickville and Concord. Boomerang Bags Inner West is doing its part to help us transition to a circular economy by providing an alternative to single use plastic shopping bags. The Inner West Council 2016 Recreation Study found that Walking was the most popular recreational activity. Largely designed and built between 1850 and 1940 the pre-car design of our neighbourhoods is conducive to walking. The exetensive tram network also influence development as did the rail lines. Public Transport not only enabled residents to travel it brought workers to the Inner West driving its industrial heritage. The tram network may have been destroyed, but buses still largely follow the tram routes. 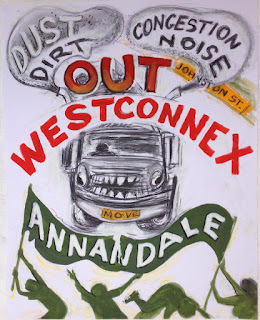 However, since the 1950s the private car has had its impact from the freeways of the 50s to Westconnex. Governments have prioritised the private car over public transport and shopping malls have been designed to be accessed by motor vehicles. Yet, despite this people are walking sometimes in very unpleasant situations and at others in quiet pleasant places away from the danger, noise and pollution of the private motor vehicle but also public transport. Pémpti Perambulers Wonder if evening strolls will take of in Annandale and elsewhere. To spark the idea, I have initiated Pempti Perambulers. Pémpti is Thursday in Greek!